a High Criminal Court hearing. The lawyers announced their withdrawal, claiming that the Court refused to refer the detainees to doctors in order to verify the torture allegations. Some lawyers justified their withdrawal by claiming that the detainees had refused to cooperate. The Public Prosecutor said that the lawyers’ decision was pre planned to achieve a specific objective, and that the decision would negatively affect the case. 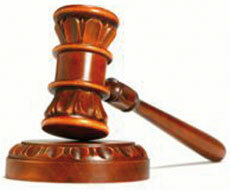 The trial judge instructed the appointment of new defence lawyers and then adjourned the case. ■ (22/12/2010): The detainees accused of terrorism offences refused to meet with their new defence council, which was appointed by the Minister of Justice and Islamic Affairs. ■ (27/12/2010): The Minister of Justice met the new defence council based on their request. Some lawyers expressed their reservation at defending the detainees because of their refusal to meet and speak with them. The Minister stressed that he did not wish to interfere in the lawyers’ work and asked them to be professional. ■ (06/01/2011): The detainees attended the sixth session with their appointed lawyers from the Ministry of Justice. The trial judge decided to adjourn the hearing to 13 January 2011 because of the withdrawal of some of the lawyers, which hindered the case. The judge ordered the referral of the lawyers who withdrew from the case to the Minister of Justice, so that the necessary measures can be taken for their breach of Article 41 of the Advocacy Law.